Why do you homeschool? I get that question a lot- especially when people find out that we have adopted 8 kids- ages 8 and under! Why would I put myself through homeschooling them? … they wonder. When making educational choices for our kids, we've looked at these verses and felt that to put our kids in public school was clearly not the right thing to do. They are still in training.... Many parents will give the 'salt and light' argument as to why they send their kids to public school. However, research shows that often times it's "reverse evangelism" that happens (Nehemiah Institute and Barna Group) . It's interesting that while the research says that 70-88% of “Christian teens” leave the church by the 2nd year of college--- 94% of homeschooled children stay in the faith. Mmmm... something speaks volumes there to me. Many parents say that they give their kids moral training at home but then leave the academics to the school system- by doing this, you are denying your children a Biblical worldview. The argument "but I'm not that smart" doesn't really hold up either because all you really have to do is stay a week ahead of them! :). I've also heard "I can't stand my kids that long"... mmm... maybe there is something that needs to be fixed there then?! Our culture is driven by a "get a good education so you can get a good job" philosophy. This philosophy only breeds materialism and a sense of being able to work hard and attain success on your own. Trusting in God is not part of the equation- again- a worldview. But the Bible says to “seek first the kingdom of heaven and THEN all these things will be added." (emphasis mine). Somewhere along the line, we've lost the Biblical model for bringing up our kids found in Deut. 6: "Listen, O Israel! The Lord is our God, the Lord alone. And you must love the Lord your God with all your heart, all your soul, and all your strength. And you must commit yourselves wholeheartedly to these commands that I am giving you today. Repeat them again and again to your children. Talk about them when you are at home and when you are on the road, when you are going to bed and when you are getting up. Tie them to your hands and wear them on your forehead as reminders. Write them on the doorposts of your house and on your gates." Educating our kids is a 24/7 job the Bible says. Our ultimate goal for our kids should be to develop their character through the Word of God, and of course academics will follow… even flow naturally out of that foundation. But to do that, it requires sacrifice and discipline on our part as parents. 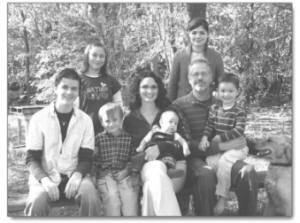 So what are some ways we (the Green family) develop character in our eight children? 1- Daily family worship. We not only start out our school day in the Word of God, we end it there as well. The beginning of our school day starts with worship, prayer, memorizing scripture, and memorizing questions and answers out of a catechism (geared towards kids). We end our day with Daddy leading family devotions, discussion time, and prayer right before they go to bed. After this family worship time, my husband takes a minute with each kid to hug them, tell them he’s proud of them and loves them. 2- First time obedience is expected of our children. When we ask them to do something, we expect a “yes mom/dad” and immediate action. By teaching our kids to obey us, we teach them to obey God’s Word for us as well. 3- The curriculum we choose. By educating our children at home, we have the distinct advantage of choosing what enters their mind and what lense they filter all other information through. 5- In our time out corner, there is a laminated sheet of paper with Bible verses about how to treat one another. After they’ve “done their time”, the appropriate verse/s are read with them before they go and restore the relationship that they damaged by their behavior. Those are just a few of the ways we’ve tried to incorporate teaching our kids the character traits we want them to leave our house with. In addition, there are other things like daily chores, servant opportunities, and practicing the behavior we expect. What Can Be Gained Through Heartache? Losing one child is enough to knock anyone off of their rocker, but three? Lynnette details the story of how the Lord has given, taken away and carried them through the sorrows and joys. It seems like a lifetime ago, but there was a time when I was a self-centered, materialistic, newlywed. I thought too often of my career, my clothes, my future dream home, and all the other things in life that don’t give a person true joy. I didn’t know Jesus and I didn’t realize just what kind of life I was missing out on. I was lost and on my way to an unhappy marriage and ultimately an unfulfilling life. God began to intervene. In January of 1990, I found out I was pregnant. It wasn’t a planned pregnancy, in fact I was still on the birth control pill, but God was beginning to do a work in our lives and his plans would supersede ours. My husband and I had talked about having children, but we only discussed what we thought would be the most attractive blend of our features… his green eyes with my dark hair seemed like the most beautiful combination for our future child. I think we thought we could place our order. It was while I was carrying our first son that my husband and I both began to think about our relationships with God. We didn’t deny God. We also knew that Jesus died for the salvation of all those that believed on him. However, we were fickle in our faith. It was merely head knowledge and hadn’t penetrated our hearts. We discussed what we would teach our son about God and decided we needed to know more, so we began to go to church. After attending my childhood church for a few weeks and soaking in the word of God, we both became excited about learning more and we both received Jesus as our Lord and Savior. After Jared was born, I became a stay at home mommy and I loved it! God was continuing to grow us up in him and we were excited about growing and serving, but he had much more to teach us! When Jared was almost a year old we began to think about adding another baby to our family; a brother or sister for Jared. It didn’t take long for me to be pregnant with our second baby. The pregnancy was very different and I had a feeling from very early on that something wasn’t right, although I couldn’t say what. A sonogram at 6 months revealed that our baby had a neural tube defect called anencephaly. We didn’t know what that was, but we were told that our baby would not survive. We were devastated, but we knew where to turn. Kyle and I clung to one another and leaned heavily on God and his word. We had learned some scripture and felt that we were beginning to gain new insight as to ‘who’ our Savior was and what his character was like, but during the three months of carrying a baby that we knew would die, we began to seek comfort and understanding with more fervor. We opened the word of God, hurting, but also excited to see what new insight we would gain. It was a somber but exhilarating time in our lives. When Samuel was born, we shared him with our family and friends. We knew his time on earth would be severely limited and we wanted everybody to have the opportunity to meet this child that God would very soon take to be with him. Samuel touched the lives of many people and when he was just thirteen days old, he left us and entered into God’s presence. We missed our precious baby, but we thanked God for a life that taught us to depend on the God we were learning to adore. We praised God for teaching us to value life and family in a way we hadn’t before (Psalm 128:3). We delighted in God for showing us that we are all fearfully and wonderfully made and that before he placed us in the womb, he knew us (Psalm 139:13-18). Samuel was no mistake. He was planned by a sovereign God that uses all situations for our good when we love him (Roman 8:28). After Samuel died, God blessed us just eleven months later with a healthy and beautiful daughter, Abigail. We had made the decision to let God plan our family since he had proven to us, through his word and our personal experience, that his ways were better than ours. (Psalm 127:1) We had a wonderful time with our baby girl and were very content with life. But God was ready to do some more work to mold us into the vessels that he wanted us to be. When Abigail was eleven months old, we discovered I was carrying our fourth child. The sonogram revealed a healthy boy, but the night that Josiah was born, it was evident that something was wrong with our nearly nine pound baby. It was obvious that Josiah didn’t have anencephaly and that gave us immediate comfort, but after his initial cry and taking in his first breath, Josiah was not able to breathe. He was immediately taken away to NICU. My husband, Kyle, followed. I didn’t worry too much because there was nothing visibly wrong with him. 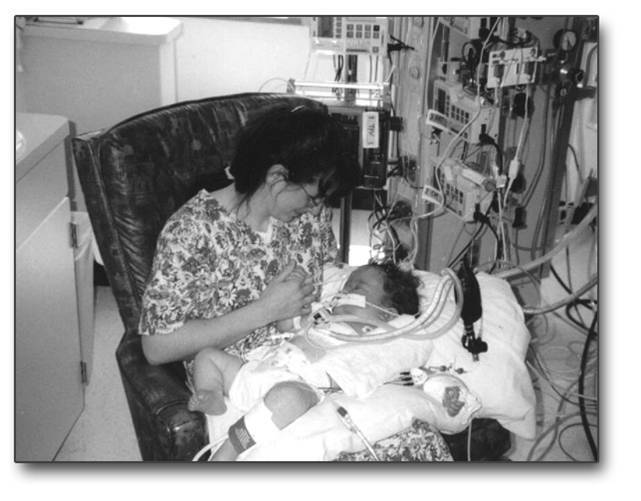 I comforted myself by thinking that he just had some fluid in his lungs, but hours later, he was still in NICU hooked up to a ventilator. We hadn’t been told yet what was wrong. Nearly five hours later a doctor finally came in and told us what we didn’t want to hear, “Your baby is very sick.” Kyle listened to the doctor while I just stared out the window in disbelief. How could we be dealing with yet another problem unrelated to Samuel’s? It just didn’t make sense. We were told that Josiah had a diaphragmatic hernia and may or may not survive. If he did survive, he would most likely live a normal and healthy life. Josiah had good days and bad, but after just five days, God took him to heaven. We would have to suffer heartache again. My heart was heavy, but my spirit told me that God would not leave us or forsake us. Just as he had helped us through our previous loss, he would also help us through this. Because it wasn’t a pre-diagnosed problem, I was less prepared and the days following Josiah’s death were difficult. I felt a deep sadness, but that all began to change when a friend of mine came over one day and turned my thoughts around and made me view my trial with a new perspective. She told me to picture the Lord asking me if I was willing to accept a new trial for his glory. Was I willing to hurt in order to draw eyes and hearts toward Jesus? Was I willing to do God’s work and suffer because he needed me to? When I looked at it that way, it gave me strength. Rather than feeling like a weak and hurting mommy, I began to feel like an honored soldier; somebody willing to suffer for the better good. It pulled me out of my despair. I would miss Josiah and look forward to being with him again one day, but for now I would carry on and continue to walk alongside my Savior. After Josiah came my sweet little Cecily. A healthy and very contented little girl! Unique challenges came with her, but not the heartache. Cecily was healthy until she was about nine months old. She came down with something that was never diagnosed, but the symptoms pointed to whooping cough. She would have attacks in the night and would stop breathing. After vomiting very thick and sticky mucous, she would begin to breathe again. It was terribly scary. It took her weeks to recover completely and it was following this illness that she changed. She began to be distant and I felt she began to look right through me. She had been very content as a young baby, but now she just wanted to do her own thing with no boundaries and she disobeyed over and over again. No matter how consistent I was in teaching, training and disciplining, she just didn’t seem to learn. She struggled most between the ages of one and three and made improvement year by year beyond that. She is eleven now and has overcome many of her issues, but continues to be quite challenged in many areas of learning. I’ve found that a non-accusing, patient and understanding heart is what is needed with her. It helps to realize that her problems in learning and behavior have not been because of rebellion but because of something that she cannot help. I’ve tried to focus on building in one area at a time rather than too many subjects all at once and this helps her to be successful at something and feel good rather than feel like a failure at everything. We are becoming victorious and things are beginning to click with her. We’ve used some neurodevelopmental exercises to attempt to trigger things in the brain that were perhaps never “turned on”. These have made a difference. I’ve also discovered that repeating things until they click, and not over stimulating her brain all at once if she’s not getting it, are helpful. We can always come back to it! Active, exciting learning times are most beneficial, and daily success is critical. I’m not perfect and admittedly I don’t always have patience, but I plan to become victorious over my weakness through much devoted prayer. I know that God will give us both victory! When Cecily was two years old, another beautiful daughter was added to our family. 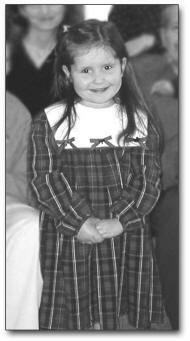 Anna was diagnosed in the womb with heterotaxy and congenital heart defects, including single ventricle, coarctation of the aorta, total anomalous pulmonary venous return and other related heart problems. When we were given this diagnosis, we couldn’t believe it. Yet a third and unrelated problem! While Samuel and Josiah both died shortly after birth, there was more hope for Anna. We were told that with a few surgeries, Anna could survive and do well. 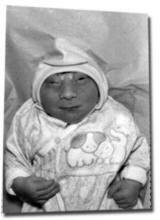 When Anna was just a few hours old she and her daddy flew to Children’s Mercy Hospital in Kansas City, MO. My parents took me and our other children to K.C.. Anna had her first ‘closed heart’ surgery when she was just three days old. It went very well and we returned home when she was ten days old. We moved to the country when Anna was a baby. We felt that the fresh air would be good for her health. We got cats, a dog, Nubian dairy goats, and chickens. We had a great time and enjoyed our new life with a fragile baby and lots of fresh air and fresh foods to keep the family healthy. 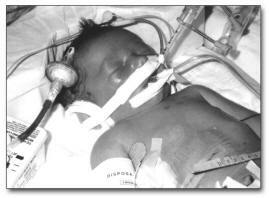 When Anna was nine months old she went in for her first big and scary open heart surgery – the hemi-fontan. This surgery didn’t have the same outcome as the first. It seemed to go well, but when the surgeon took the ventilator off of Anna, she went into respiratory arrest and would have died had they not resuscitated her. She barely clung to life for over a week, and when she was not so fragile, another heart catheterization was performed to try to figure out what went wrong. When it was discovered that her veins had become obstructed following the previous surgery, they decided to go back in the following day to repair them. This surgery would be her only hope. I remember reading the Psalm for that day which was Psalm 21. Referring to God delivering David and giving him strength, Psalm 21:2 says, “Thou hast given him his heart's desire, and hast not withholden the request of his lips”. I hoped and prayed that God would give me my heart’s desire and would not withhold my request for Anna to come through the surgery well and be able to return home with us. God did just that. Anna did come through her surgery and after three long weeks in the hospital finally got to go back to her home in the country with her brother and two sisters. The next five years were peaceful. God didn’t allow many trials. Our health was good, our home was happy, and two new healthy boys, Silas and Jonas, were added to our home. God had brought us unhealthy babies with every even numbered child in the past (numbers two, four and six), but Jonas was baby number eight and he was healthy. We didn’t know if there was any real pattern, but we half expected number eight to have some health issue. He didn’t and we were grateful! Anna’s long-term prognosis was unknown. The medical books said that children with heterotaxy and heart defects weren’t expected to live very long, but her doctors changed their diagnosis every time they saw her. We were told she could live “two years” to “decades”. So, we just determined to not think about it. What is life if you worry through every day? No, we would see Anna in our future. We couldn’t survive any other way. When Anna was a baby, we prayed for her heart problems to go away, but as she got older, we began to pray for God’s strength for her and for us, and we quit asking God to take her heart problems away. We wanted to teach Anna to be content with the way that God created her. He knew what he was doing and had a purpose for his design. She needed to know that we loved and adored her just the way she was and that she was not a reject. The term “birth defect” has always bothered me because when we think of something defective, we think of something inadequate or weak. Anna was certainly NOT that! God used her heart problems to make her stronger in many ways, and to help her see her need for him. She was an incredible young lady and truly lacked nothing in character, love or beauty. Anna grew into a smart, witty and beautiful little girl. She had a huge vocabulary at a very young age. When she was barely two years old, we went to a friend’s house for fellowship. Usually Jared or Abigail would unbuckle her car-seat. When I realized she hadn’t popped out of her seat I said, “Anna what’s taking you?” She said, “I can’t get this contwapshun to work”! It was so funny! As she got older she loved to mother her little brothers. When Silas was being ornery she’d firmly say, “Silas John!” She made us laugh often. She was just a huge blessing to each member of the family. When she was almost six years old, Anna accepted Jesus Christ as her Savior and was baptized by her daddy. In August, Anna’s health began to deteriorate. On November 19th, 2004, Anna breathed her last breath at home in her mommy’s and daddy’s bed. There were signs of a failing heart, but nothing could have prepared us for that day. How can you ever be ready for your precious child to die? You can’t. However, in the midst of all the pain, God was faithful! (I Cor. 1:9) I’ve never felt his presence so strong. I’ve never felt his love so great. He walked beside each of us along a very sorrowful path. I can tell story after story of things the Lord did to give us hope. I’ve since given birth to another precious and healthy son, Harrison, and I find myself satisfied, completely and utterly satisfied. Why? Because I’ve lost and I’ve gained. I’ve suffered and I’ve recovered. I’ve mourned and I’ve laughed. I’ve learned to be content. If Harrison would have been born unhealthy, I would have hurt, but because of my trials, I would have been able to endure the affliction with more confidence. I would have known how to survive. Through our suffering we gain patience, experience and hope (Romans 5:4). Trials and afflictions (that are not sin trials) are not the enemy, they are God’s way of teaching us and we should be grateful for the opportunity to learn to serve him and minister to others because of them (II Cor. 1:4). Last year I completed a book that tells our story in more detail. I’m in the process of looking at options for publishing. I think about what my life would be like, had I not experienced these trials. I’m so happy to have a story to tell; a story that can not only help others who are hurting, but a story that reveals God’s character through the way he cared for me and my family down our road of challenge, heartache and victory. It’s an exciting life to walk with God, a life I’m excited to share with others. I leave you with a couple of my favorite verses: Psalm 119:75 “I know, O LORD, that thy judgments are right, and that thou in faithfulness hast afflicted me.” Psalm 119:67 “Before I was afflicted I went astray, but now have I kept thy word.” What a privilege to be used of God – even to suffer for his glory!